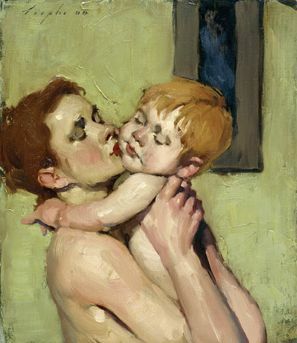 Malcolm T. Liepke’s work is beautiful. It is unabashed, confident, and human. He does plenty of portraits, yes. Portraits of females posing in various fashions, many looking directly out into the viewer’s eyes. These can be interesting paintings, to be sure, though many feel a tad too artificial for me. I see so much more depth of talent to those paintings that appear as scenes. You see, Liepke has a way of composing these paintings that subtly masks layers of content in simple strokes of paint. The longer I look, the more intricately I see a narrative blossoming from the weaving of brushstrokes and color. Oh–and I’ll go ahead and warn you that I resorted to making many a list in this post. The paint is thick, and the strokes are often wide-set; there is a physical weight to material here, and so subjects appear decidedly set, unchangeably anchored in their place. That is where they are and where they are meant to be. 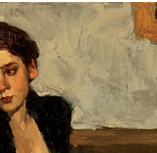 Indeed, sometimes Liepke increases this formal stability by including strong horizontal and/or vertical lines in the scenes, such as a corner of a wall, a frame, or the position of a limb. 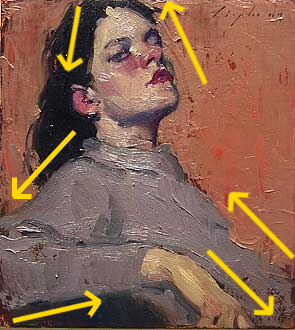 There usually isn’t too much detail in the scenery, but Liepke almost always includes an object with a strong horizontal or vertical orientation (see Figure 1). Yet, despite this build-up of material and texture, the figures do not seem stoic and weighted. These brushstrokes are painterly. They are not perfectly blended, nor are they all contained within the shape they intend to create. There are “stray” strokes and those of different thicknesses. Yes, these brushstrokes can be awkward, variable, and imperfect: (dare I say?!) they echo the nature of the human that made them. Now, if nothing else, Liepke understands how to pose models. They are not in ridiculous poses, but he seems to amp-up the drama of a natural pose. How? So far as I can tell, it’s all about the angles, and he uses contrasting tones/hues to accentuate those lines. For example, arms are usually bent into sharp angles, and I’ll argue that these positions invite even more energy into the painting. How so? 1. Look at a bent arm. The diagonal lines that position creates suggests movement and energy. Think of a slide, a ladder, stairs, a lever. 2. Bend your arm. It takes energy to do that, to keep your arm bent. Not only that, your arm doesn’t stay bent; it naturally extends. There is kinetic energy in a sharply angled arm. 3. An arm is distinctly horizontal. When this happens, the subject is often applying weight to it (i.e. leaning against it). The muscle looks taut or stretched. There is force applied and force resisting. It isn’t only arms. Sometimes Liepke angles bodies to be distinctly diagonal. Even backgrounds have a presence; thick, immovable paint strokes. They create an fascinating “negative space” that, well, acts somewhat like negative space. The space balances the foreground figures at least. However, the “blank space” is not really very blank but dynamic in its own right. Look at the blank walls or the sand that surrounds figures: if you single these areas out, they bloom into spaces brimming with activity (see Figure 2). Such a dynamic background seems to move forward in the painting. It’s fascinating, the duality that arises here. At one moment (when you are focusing on the foreground figures) the background objects appear far away, but as you focus on those backgrounds, they blossom forward in space. Neat! 2. A subjects’ eyes are focused on something outside of the picture. You can follow their line of sight all the way…off the painting. 3. The subject’s entire body does not fit into the frame. OK, sure, that is normal in portraiture; often the lower half of the body is missing. However, these subjects are missing a foot, a forehead, an elbow, a knee… Your gaze catches on the unexpected loss. 4. Subjects are placed off-center. Not just off-center. The meat of the image can be piled onto one side (see Figure 3). Indeed, it seems as though the artist just took a quick snapshot of the situation, so eager to capture the feelings of the moment, he forgot to center the subject in the frame. 5. Liepke sneaks the “way out” into the frame. Sometimes it is obvious and you can see the room stretch out and fade into darkness. Sometimes he will squeeze in a sliver of a horizon line, a corner of a wall, or a window. These areas are also dark and lack detail, expanding to who-knows-where. Within these holes of darkness, the world has unlimited distance and space, without which the whole scene might appear much more flat. 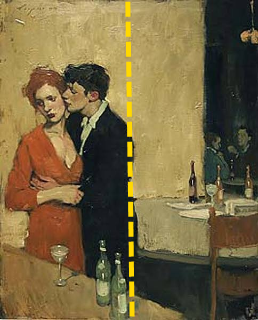 But despite these “hints”, Liepke does not distract from the scene itself. He makes quite sure that forms are visually balanced and that lines leading off the page have a path back (eee Figure 4). The painting can formally stand on its own, but it stirs and ignites the viewer’s belief and curiosity in the world beyond the frame. Well, said, Malcolm. Well said. p.s. It was curiously difficult to find images of his work, and many of them do not have titles. Sorry!